Hokusai’s The great wave off Kanagawa remains the enduring image of Japanese art. The print depicts a giant wave with unmistakable frothing tentacles poised to smash a boat below. 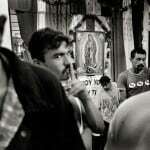 The boat’s occupants toil uncaring or unaware of the hovering deluge – the curve of their vessel matching the lines of the heaving sea around them. With the intense drama unfolding in the foreground, the central image of the work – the white-capped Mount Fuji – is easily missed, or mistaken for another ocean crest. Although diminutive in scale, the importance of Hokusai’s “Great Wave” cannot be overstated. The work profoundly motivated the French Impressionist movement, which in-turn shaped the course of European Modernism, the artistic and philosophical movement that would define the early 20th century. As such, this small print exhibited at the National Gallery of Victoria from July provides a valuable link to the gallery’s recent Van Gogh exhibition. The most immediate and attractive aspect of Hokusai’s wave is its colour. At 70 years old, Hokusai was a master and created the image using four printing blocks. The astounding power of the work belies its restrictive palette – it’s essentially a study in blue. The story of this blue pigment highlights the role of cultural exchange at the heart of creative discovery and ranks among the more contradictory tales in the history of art. The vibrant hue, long considered to be quintessentially Japanese, was actually a European innovation. Detail from Katsushika Hokusai, The great wave off Kanagawa (Kanagawa oki namiura), (1830–34), from the Thirty-six views of Mt Fuji (Fugaku-sanjū-rokkei). 25.7 × 37.7 cm. In truth, it had been invented half a world away, 130 years before Hokusai’s wave broke, in an accident involving one of Europe’s most colourful figures: Johann Conrad Dippel. Born in the actual “Castle Frankenstein” in Germany in 1673, the enigmatic theologian and passionate dissector believed the souls of the living could be funnelled from one corpse to another, thus becoming the rumoured inspiration for Mary Shelley’s masterpiece, Frankenstein. In his thirties, Dippel had become captivated by the proto-science of alchemy, but like so many in the profession, had failed to convert base metals into gold. He instead settled on the apparently easier task of inventing an elixir of immortality. The consequence was Dippel’s oil, a compound so toxic that two centuries later it would be deployed as a chemical weapon in World War II. To cut costs in his Berlin laboratory, Dippel lab-shared with the Swiss pigment maker Johann Jacob Diesbach, a fellow scientist engaged in the lucrative business of producing colours. One fateful evening around 1705, when Diesbach was preparing a batch of crushed insects, iron sulphate and potash in a reliable recipe for a deep red pigment, he accidentally used one of Dippel’s implements infected by the noxious oil. The following morning the pair found not the expected red, but a deep blue. The immense value of the substance was immediately clear. The recipe for Egyptian blue used by the Romans had been lost to history some time in the middle ages. Its substitute, lapis lazuli, consisting of crushed Afghan gemstones, sold at astronomical rates. So the discovery of a stable blue colour was literally more valuable than gold. Adding further worth, the pigment could be blended to produce entirely new colours, a process that the costly lapis lazuli did not allow. 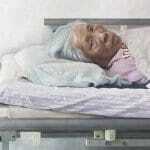 The discovery sparked “blue fever” in Europe. Dippel, suddenly forced to flee legal action in Berlin for his controversial theological positions, failed to commercialise the newly named “Prussian blue”, but his dazzling co-invention was a secret too big to keep. Within a few short years, the recipe had gone into factory production. It was used extensively in painting, wallpaper, flags, postage stamps, and became the official uniform colour of the Prussian Army. People seemed drunk on the stuff. Indeed, they were actually drinking it. By mid century, the British East India Company was dyeing Chinese tea Prussian Blue to increase its exotic appeal back in Europe . In the early 1800s, a Guangzhou entrepreneur deciphered the recipe and began manufacturing the pigment in China at a much lower cost. Despite Japan’s strict ban on all imports and exports, the colour found its way to the printmaking industry in Osaka, Japan where it was trafficked as “bero”, a derivation from the Dutch “Berlyns blaauw” (“Berlin blue”). Its vivid hue, tonal range and foreignness saw it explode in popularity just as it had in Europe. 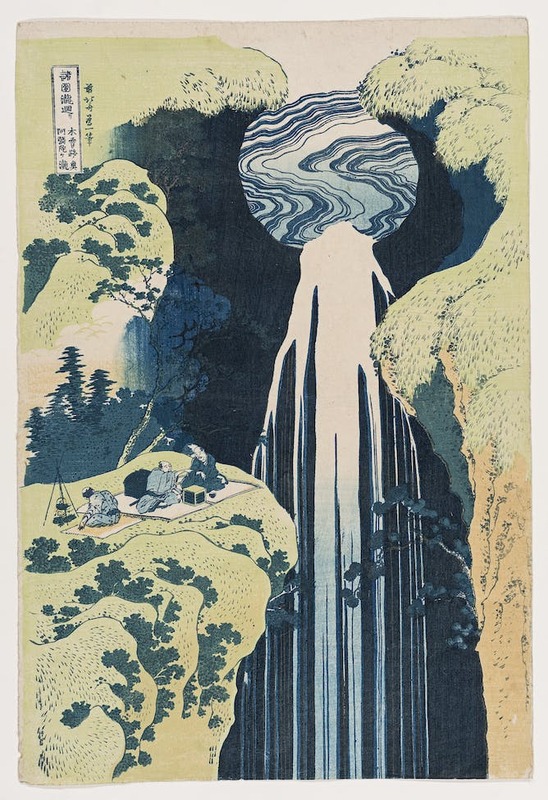 Katsushika Hokusai, The Amida Falls in the far reaches of the Kisokaidō Road (Kiso no oku Amida-ga-taki) (1834–35) from the A tour to the waterfalls in various provinces (Shokoku taki meguri) series. Hokusai was one of the first Japanese printmakers to boldly embrace the colour, a decision that would have major implications in the world of art. Using it extensively in his series Thirty Six Views of Mount Fuji (1830), of which the Great Wave was the first, the pigment especially lent itself to expressing both depth in water and distance, crucial atmospheric qualities to render land and seascapes. Hokusai and his contemporary Hiroshige became renowned for their depictions of pure landscape form. But although extremely popular in mainstream society, these woodblock prints were seen as vulgar by the Japanese literati and beneath consideration for artistic merit. When Japan’s isolationist policies finally ended under threat of war from the US Navy in 1853, the prints were used as wrapping paper for more worthy trade trinkets. Following Paris’s International Exposition of 1867, their value dramatically shifted. 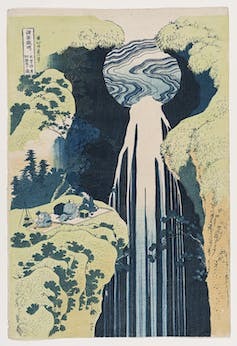 A showcase at the inaugural Japanese Pavilion elevated the artistic status of woodblock prints and a craze for their collection quickly followed. Among the most prized were the striking blue landscapes, particularly by Hokusai and Hiroshige, that led European artists to incorrectly deem the colour as idiosyncratically Japanese. It wasn’t just the colour, style and execution of Hokusai’s prints that made them so radically influential, but the subject matter too. 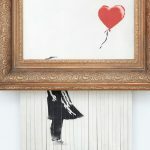 His collection of “manga” sketches elevated everyday street life in to the realm of art, ideas that were a revelation for Edgar Degas and Henri de Toulouse-Lautrec. 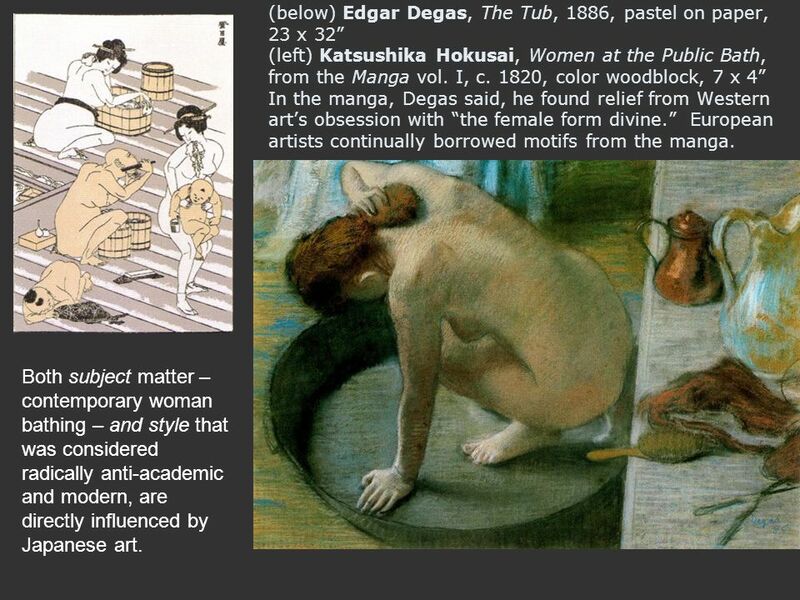 Both borrowed heavily from Hokusai’s depictions of marginal society and the bodies of women in repose. Claude Monet was so seduced by the “Japonism” aesthetic he acquired 250 Japanese prints, including 23 by Hokusai. The obsession bled from Monet’s art to his life and the painter modelled his garden after a Japanese print while his wife sported a kimono around the house. Perhaps the single most vividly identifiable influence upon the European modernist founders is Van Gogh’s celebrated Starry Night, which owes everything to Hokusai’s blue wave from its colour to the shape of its sky. In letters to his brother, Van Gogh professed the Japanese master had left a deep emotional impact on him. The importance of Hokusai to the early European modernist movement is both immense and well mapped. Much less known is the extent to which Hokusai had himself borrowed from European image culture. Although in the artist’s lifetime, Japan was subject to Sakoku, the 250-year policy that forbade exchange with the outside world on penalty of death, a clandestine group of Japanese artists and scientists had dedicated themselves to studying the exotic mysteries of Western representation. Hokusai drew influence from a particular “Rangakusha” (scholar of Dutch texts) painter named Shiba Kokan, who experimented with European principles of composition. 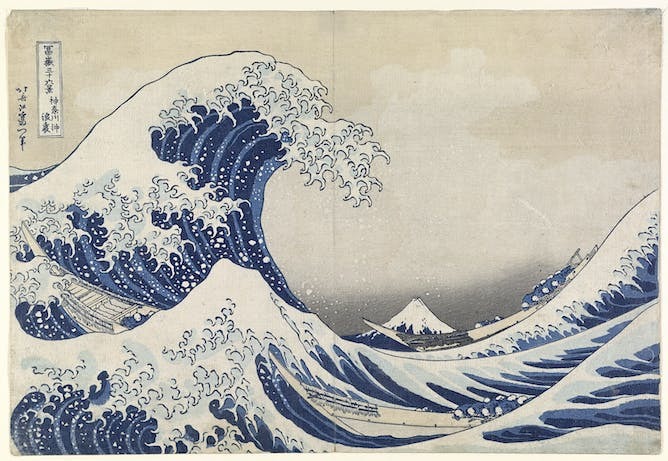 In The Great Wave, Hokusai abandoned traditional Japanese isometric view, where motifs were scaled according to importance, and instead adopted the dynamic style of Western perspective featuring intersecting lines of sight. This lent the work the dramatic sense of the wave about to break on top of the viewer. The embracing of his final works by Europeans is in part due to Hokusai’s use of a familiar compositional style. Yet this historical truth lay dormant for decades as it deeply contradicted the European vision of Japan. In the Western imagination, Japan was a land preserved in amber, a pure and innocent people in close communion with nature whose isolation had sealed them from the horrors that industrialisation had wrought upon Europe. In reality, Hokusai had skillfully blended European colour and structure with Japanese motifs and techniques into a seamless work of international appeal. 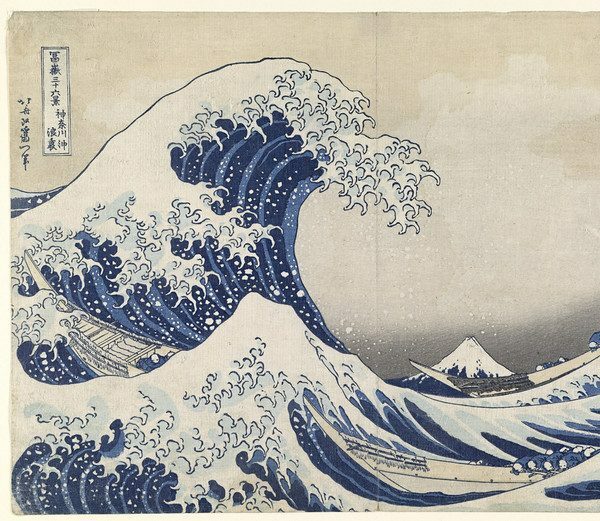 Certainly, without Hokusai’s striking print, the great wave of European Modernism might never have happened. The art of Hokusai will be showing at the National Gallery of Victoria until October 15 2017.